Description: The wide Band Log Periodic Directional Antenna will collect the cell tower signal and send it through the cable to an amplifier, cell phone or cellular data card. When the cell phone or cellular data card transmits, the signal is transferred to an amplifier or directly to the antenna and broadcast back to the cell tower. The main benefit of the this unique multi-band Yagi antenna is its ability to focus its signal in one direction leading to the greater gain figures. 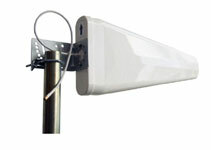 This antenna is designed for use on stationary objects such as buildings. If this antenna is not correctly aimed, it will lose its effectiveness. This unique multi-band directional antenna covers the entire spectrum from 700 MHz to 2.7 GHz and can be used for all cellular frequencies including 700 MHz LTE, 1700/2100 MHz AWS, 850 MHz Cellular and 1900 MHz PCS bands, Euro/Asian standard 900 and 1800 MHz bands, WCDMA 2.1 GHz, Nextel 800 MHz, and the 2.5 to 2.7 GHz WiFi/WiMax band. This directional ultra wideband log periodic antenna covers a very wide frequency range with high gain. Because it covers both cellular, PCS and WiFi worldwide frequencies, it is very useful for CPE equipment and base station equipment needed for these frequency bands minimizing the amount of equipment needed for each service location. This antenna can be used indoors or outdoors and comes complete with all components needed for pole mounting or wall mounting The sealed housing is UV stabilized ABS plastic. The backplate is stainless steel with stainless steel fasteners. All bracket components are stainless steel as well for corrosion protection. 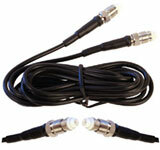 The pigtail is 16" outdoor rated cable terminated with an FME Male connector.